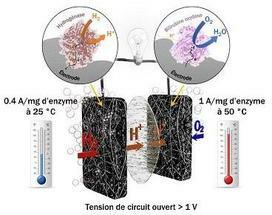 A fuel cell converts chemical energy into electrical energy via hydrogen combustion. Though it is considered to be a clean technology - because it does not emit greenhouse gases - fuel cells do use costly rare metal catalysts1, such as platinum, to oxidize hydrogen and reduce oxygen. In recent years, the identification of biocatalysts, enzymes with remarkable properties, has revitalized research in this area: their oxygen, and especially hydrogen, transformation activity is comparable to that of platinum. Hydrogenase activity was, until recently, inhibited by oxygen and therefore incompatible with use in cells. For several years, researchers in the Laboratoire of Bioénergétique et Ingénierie des Protéines (CNRS/Aix-Marseille Université) have been developing a new generation of biocells. They have replaced the chemical catalyst (platinum) with bacterial enzymes: at the anode, hydrogenase (key for converting hydrogen into many microorganisms), and at the cathode, bilirubin oxidase. They have now identified a hydrogenase that is active in the presence of oxygen and resistant to some platinum inhibitors like carbon monoxide. In collaboration with the Centre de Recherche Paul Pascal (CNRS/Université de Bordeaux), they also explored biodiversity to identify heat-stable enzymes that can withstand temperatures between 25°C and 80°C.